Farmer Rich Collins is passionate about endive production. There is just one commercial producer in California of endive, a missile-shaped French-Belgium sprout from a chicory root that boasts culinary versatility, but lacks popularity. Endive (pronounced on-deeve) adds a bitter bite to salads and stir-fries and its white leaves make little boats to hold other ingredients for dainty hors d'oeuvres. The biggest challenge for an endive producer, said entrepreneur Rich Collins, is marketing a product unfamiliar to most Americans. On average, U.S. consumers eat four leaves of endive a year; in France per consumer consumption is about 8 pounds a year, and in Belgium double that. Collins spent this morning touring about 50 food bloggers who are in Sacramento for the International Food Bloggers Conference around his endive operation so their increased awareness of this specialty vegetable will translate to greater appreciation among their readers. Collins was introduced to endive in 1978 while working as a dishwasher in a Sacramento restaurant. The owner said he paid $4 a pound for imported endive and challenged Collins to grow it in California. Collins went to Europe as a "horticultural vagabond," he said, to learn the ropes. Back in California, Collins began producing endive in 1982, and never stopped. 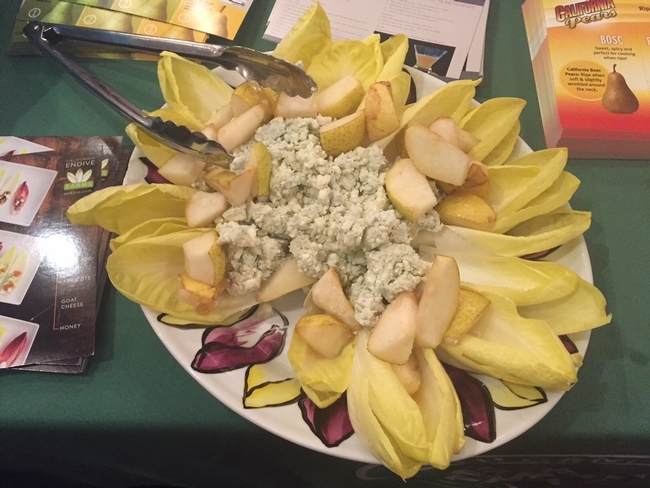 "It took 10 years to learn how to grow endive in California," Collins said. "It's not an easy crop to grow." The primary pest concern is bacterial or fungal problems since the sprouts are forced in a warm, moist environment. Early on, Collins got help from Robert Kasmire, UC Cooperative Extension post harvest specialist at UC Davis. A portrait of Kasmire hangs prominently in the California Endive Farms facility in Rio Vista. "He helped me out quite a bit," Collins said. 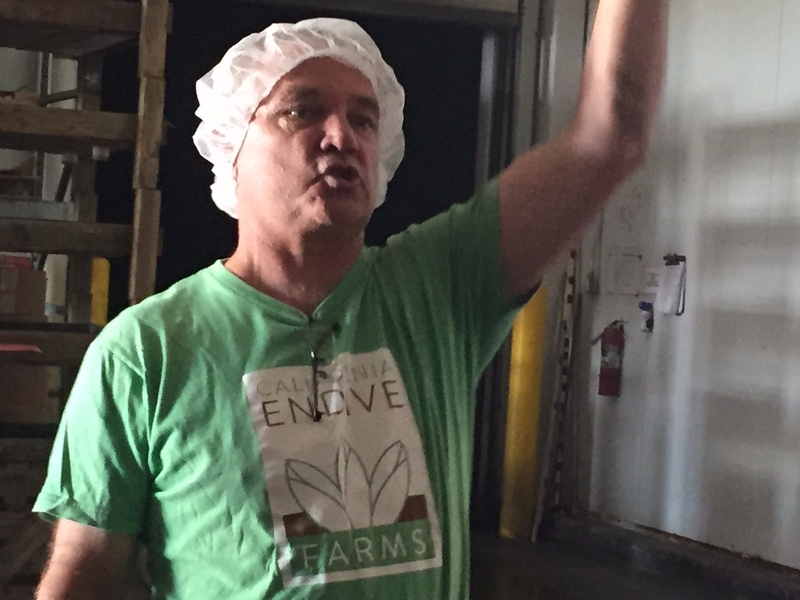 Today, the company he built supplies 50 percent of the U.S. endive market. The California Endive Farms ships its products weekly year-round to Trader Joes and Whole Foods markets. For Collins, however, it's now time to retire. He sold California Endive Farms to the grandson of one of his production mentors in France, but he won't be leaving agriculture. This week, Collins sat down with UC Cooperative Extension specialist Jeff Mitchell to plan his retirement on a 200-acre farm he and his wife own near UC Davis. Mitchell is chair of the UC Conservation Agriculture Systems Innovation Center, which promotes the use soil care practices to improve carbon sequestration, reduce dust emissions, save water and increase yield in agricultural production systems. The practices can include no-till and minimum tillage farming, cover cropping, enhancing the diversity of above-ground species and underground soil biology, surface residue preservation, and compost applications. Currently Collins grows 30 acres of asparagus and allows four young farmers to use space on the property to get started in agriculture. "We now want to get in the realm of soil development," Collins said. 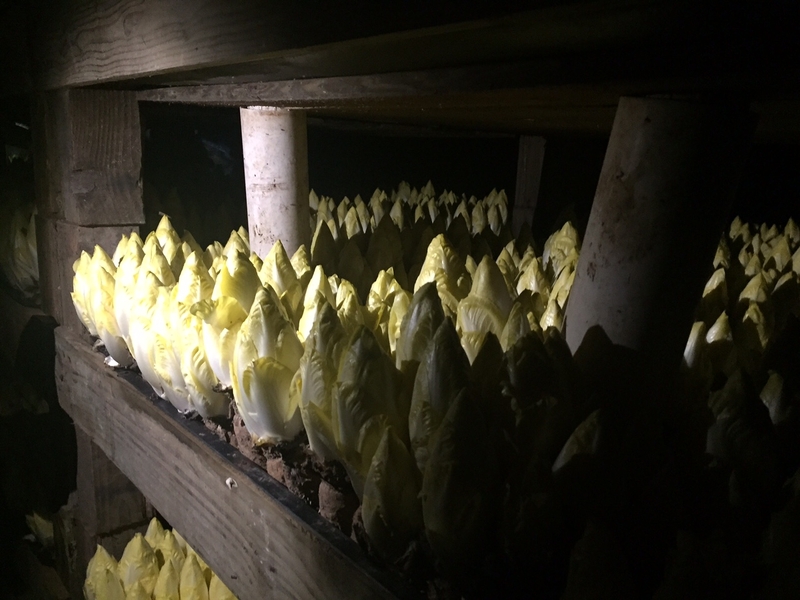 Endive sprout from chicory roots in a dark, warm room. Endive can be used to make attractive appetizers.